To us has been given a most pleasant assignment, but one that we regret that we do not have the power of expression to convey concerning Claud Lee Austin, who served as Grand Master of Masons in Texas, having been installed at our 108th Grand Annual Communication in December, 1943, and presiding over the 109th Grand Annual Communication of the Grand Lodge of Texas in December, 1944. Brother Austin was born July 23, 1898, the son of James M. Austin and Ida Bowen Austin. His father was born in Paducah, Kentucky, in 1857 and his mother was born in Dallas, Texas, in 1868. The Grand Master was born in Dallas, Texas, and has resided there from that time up to January 1, 1945, when he moved to the City of Fort Worth. Early in life- Brother Austin turned to the accounting field and has been a valued employee in the accounting department of the Magnolia Petroleum Company for twenty-five years. On February 10, 1920, he was married to Miss Mildred Robinson, also of Dallas, and they are the proud parents of an only son, Claud L. Austin, Jr., a petty officer now serving in the United States Navy and stationed somewhere in the Pacifie area of war. Brother Austin was privileged to confer each of the three degrees upon his splendid son, conferring the degrees while serving as Grand Senior Warden. Brother Claud, as he is affectionately known in Texas, was initiated in Oak Cliff Lodge No. 705 of Dallas on December 6, 1919, and was raised to the sublime degree of Master Mason in the same lodge on February 14, 1920. To him comes a most unique and unusual distinction in that exactly twenty-five years from the date that he was initiated as an Entered Apprentice Mason he presided as Grand Master over one of the most largely attended meetings of the Grand Lodge of Texas in 1944. Brother Austin was a charter member of A. C. Garrett Lodge and served as its first Senior Deacon in 1925. He served as Worshipful Master in 1928 and still retains his membership in this lodge. Brother Austin received the Chapter degrees on October 6, 1922, in Oak Cliff Chapter 373, R. A. M., and the Council degrees in Oak Cliff Council 310 on October 25, 1922. The Commandery degrees were received in Tancred Commandery No. 82, the Order of the Temple being conferred on March 13, 1923. He received the Scottish Rite degrees in November, 1926, and May, 1927, and has been active for many years in the conferring of the eleventh degree in the Dallas Consistory. Brother Austin was initiated into Hella. Temple, A. A. O. _N. M. S., on November 17, 1923. Brother Austin and his wife are both members of A. C. Garrett Chapter No. 774, O. E. S., and served as Matron and Patron together in 1930. Our immediate Past Junior Grand Master is a member of St. Mark’s Conclave, Red Cross of Constantine, located at Dallas. In 1933-1934 Brother Austin served as District Deputy Grand Master of the 14th Masonic District of Dallas County, under Past Grand Master Steve Cooke, and in 1931-1932 was Grand Visitor of the 14th District, R. A. M, under P. G. H. P. Hardy Petty. In the Grand Royal Arch Chapter of Texas, Brother Austin served as a member of the Credentials Committee in 1932-1933, as Grand Master of the First Veil in 1933-1934 and as Grand Orator in 1944. In 1939 he served as chairman of the Committee on Memorials and was elected a member of the important Committee on Work of the Grand Lodge in 1937 and 1938, serving as chairman of this committee in 1939. At the Grand Annual Communication in 1940 he was elected Grand Junior Warden and installed Most Worshipful Grand Master in 1943. 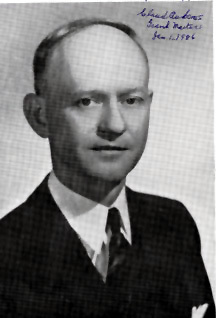 Due to the fact that the Grand Master of 1943, Right Worshipful Brother Rogers Kelley, was serving as an officer in the United States armed forces and was out of the State, again Brother Claud had the unique experience of presiding as Grand Master in 1943 over the 108th Grand Annual Communication. For many years while holding no official position in our Grand Lodge, this good man and devout Mason was quietly and unobstrusively going about the Grand Jurisdiction of Texas assisting and counseling with untold numbers of Masons and lodge officers. Probably during those years and the years that he was serving as a member of the Committee on Work and as an elective officer of the Grand Lodge of Texas, Brother Claud visited more lodges, met more Masons and knew more Masons by their names than any other Mason in the history of our Grand Lodge. No lodge has been too small, no lodge has been too far distant, no weather has been too inclement, and no private business has been too pressing and important to prevent Brother Austin from responding day and night in answering calls from lodges in Texas to visit them, to exemplify the work for the brethren, or to lend his presence at countless Masonic meetings. The Masons of Texas expected big things from Brother Claud as Grand Master during his year as such, but the results were far beyond their expectations. Serving as Grand Master in 1944, he was confronted by many obstacles caused by the disruption of ordinary modes of transportation and other matters due to the exigencies of the times by virtue of war conditions. His mail naturally reached an all-time peak, and the demands upon his time were far beyond that which an ordinary Mason could understand and appreciate; yet with it all the record discloses that he made about one hundred thirty visitations, visited more than one hundred families whose loved ones were serving in the armed forces, and made several trips out of the State of Texas upon Masonic business; and at no time was any complaint heard from this good man, nor was there ever absent from his face the gracious smile for which he is so well known; nor could any detect a lack of strength or warmth in his friendly handshake. During the year Brother Austin coined, so to speak, as the foundation for his administration and to be carried out by every Mason in Texas, the slogan “Service-Happiness,” and at each of his meetings the attending brethren were given a miniature 24-inch gauge, and using his slogan and the explanation of the gauge, so well known to all Masons, he brought home to all who were privileged to hear him the crying need and dire necessity of carrying out his slogan and the meaning of the 24-inch gauge each and every hour of the day. The Masons of Texas know that he himself down through the years has practiced daily the things that he preached; and his unselfish service, his adherence to the principles, tenets and landmarks of the Ancient Craft, his unfaltering faith and belief in God, his active and never-failing support of the churches of this nation, his devotion to his wife and son, and his unflinching friendship demonstrated on so many occasions have won him a place in the hearts of the Masons of Texas second to no living man. The directors of our great Masonic Home and School at the close of Brother Claud’s administration announced that by reason of resignation the superintendency of our Home and School was vacant, and that they had unanimously appointed Brother Claud as superintendent, placing in his hands the moral, intellectual and spiritual guidance and training of those boys and girls who now reside at the Home and School and that may enroll in the future. This announcement brought the unanimous approval of more than fifteen hundred Masons gathered on this memorable occasion. Masonry in Texas needs, and we know will continue to receive, the services of Brother Austin, his leadership and his endeavors to bring happiness to his fellowman by living Masonry each day of his life.